Seven thousand meters—roughly the equivalent of 4.4 miles, or the distance of the Great Chesapeake Bay Bridge Swim. It’s also the distance I swam at the Wilson Aquatic Center on Sunday to prepare for the Bay Bridge Swim on June 12. Swimming to Hemingway’s, a blog dedicated to Bay Bridge Swim training, suggests a workout called “The Hemingway,” which consists of a 1,000 followed by three 2,000s to get to 7K, and that’s roughly what I did on Sunday: 3X2,000 meters, then 2X500. The last two were to prepare me mentally for feeling like I *should* be done at the end of the bridge, but still having to swim several hundred meters to shore. In short, the swim felt great, and brought me to 25K for the month in the 50K in May challenge. I felt so great, in fact, that I didn’t even have to resort to singing Nicki Minaj and Eminem lyrics to myself the last few thousand meters. 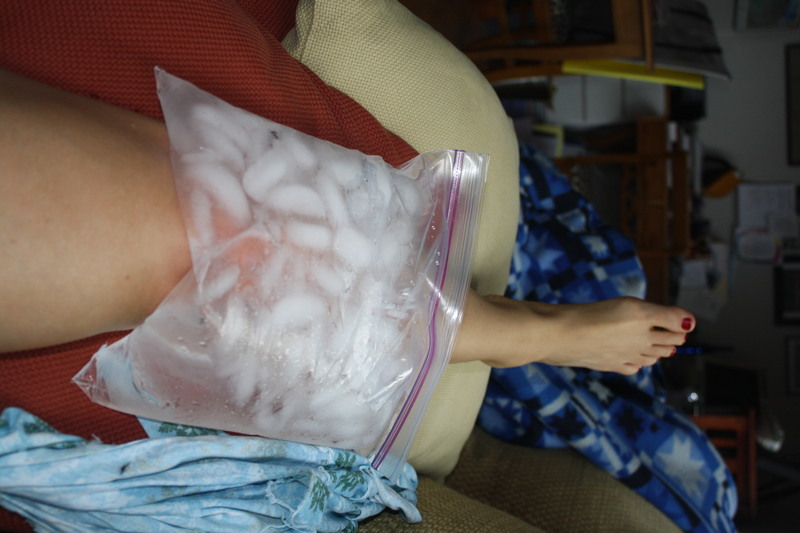 Seventy-million ice packs. I’m so intensely sick of these, and have needed a seemingly endless supply of them since completing the above. That’s all. Seven pints of blueberries. Long swims, like long runs, do funky things to my metabolism. I’m hungry constantly, and in an effort to make sure my wetsuit still fits in June, I’m filling up on the awesome blueberries on sale at Giant. I tried counting the number of pints I’ve eaten over the past three or four days, and it did, indeed come to seven. (Editor’s note: I actually just stopped counting at seven, which is the same thing, right?). 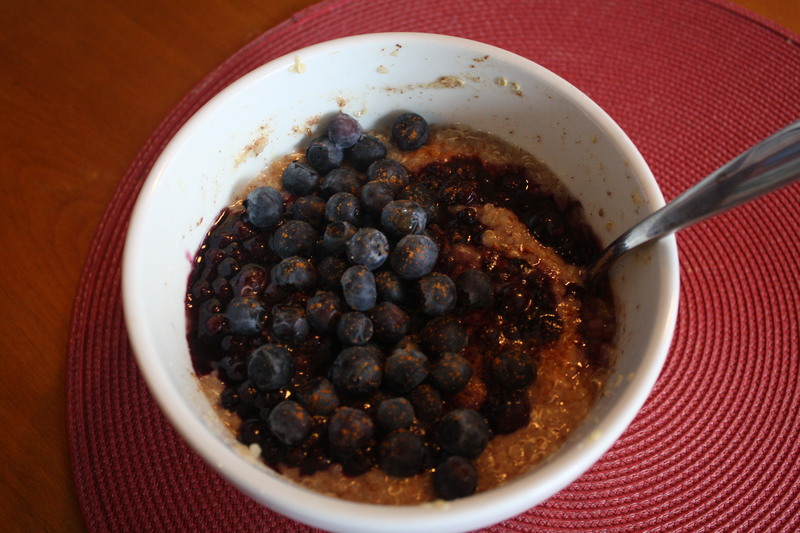 This included cinnamon-berry quinoa, shown below, before my long swim. 70.3, the number of miles Katie at Run This Amazing Day covered in the Kinetic Half Ironman last weekend. I’m way more impressed and motivated by gutsy performances than fast ones (whatever “fast” means), and the fact that Katie trained for this race through injuries and finished the run on fumes is simply astounding to me. Five to seven weeks: The number of weeks of radiation my best friend Alexis is getting ready to start, now that her chemo is complete. 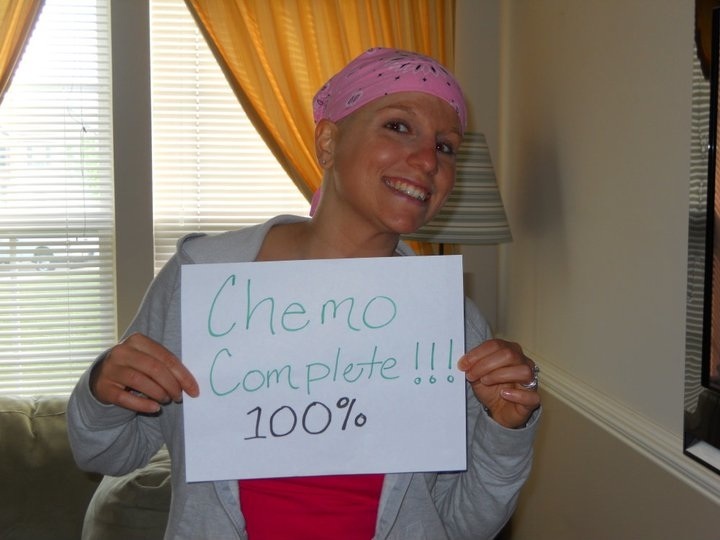 She says chemo left her feeling like she had been hit by a truck. You know what she does as soon as she feels better again? She runs. Read her description of getting back on her feet—literally—here, and remind yourself of it next time you need to infuse your daily run with some gratitude. I’m totally loving the berry sales in grocery stores – especially the killer strawberry sales. And nice work on that 7k swim – yowzers! Amy, I have followed you for the longest time on Twitter and only just now found your blog. I am so glad to have some across it. I am so glad that I did. I’m so glad you did, too! I’ve read your terrific fitness column in The Capital, and I’m looking forward to catching up on your blog, too! And in keeping with the 7 theme…its definitely 7 weeks of radiation (look for my blog recap later). 7 miles? Go you! 7 pints of blueberries sounds amazing. I just ate some strawberries from Easton, MD and instantly thought of you! It’s Matt – the guy who writes the “Swimming to Hemingways” blog. Well Done! on doing your own version of THE HEMINGWAY!… how long did it take you? Thanks for reading the blog and sharing it…is this your first Bay Swim? Got any questions or topics you want me to write about between now and the swim? Thanks again. Thanks for stopping by—and for the great workout idea! It took me about 2 and a half hours, including rest stops between reps. I’ve done the “baby Bay” 1-miler before, but never the full 4.4-miler. I’d love to hear about which workouts were most helpful to you, and what you wish you’d known before the swim, if you do any posts before the race … make sure you send a link if you do!